Get Ready! was developed by NFPA, and made possible by the Fire Prevention and Safety Grant funding through the U.S. Department of Homeland Security, Office of Domestic Preparedness. Recent disasters have shown just how much communities count on their firefighters and other first responders to keep them safe and protected. But they have also revealed the strains placed on our emergency personnel during times of crisis. Today, more than ever, first responders and local residents must work together to prepare their cities and towns for disaster. For firefighters that means reaching out to members of their communities with essential safety information. To aid in this life-saving work, NFPA has developed a comprehensive guide for fire departments. The goal is simple: to give firefighters and other first responders the tools they need to help local residents prepare for disaster — before disaster strikes. 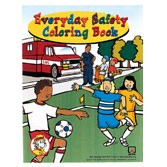 Teach children to protect themselves by observing important safety rules! 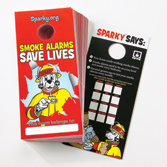 Smoke Alarm Door Hangers raise awareness and provide a reminder for monthly testing.